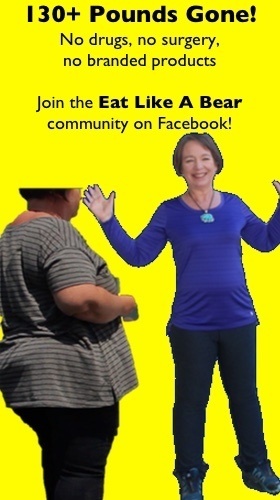 Amanda’s note: Here is another great tutorial from Ramya Venkateshwaran, writing in India from her website WildTurmeric.net. I asked her to share her process for rose water and was delighted again with her wealth of experience. You will see what I mean. 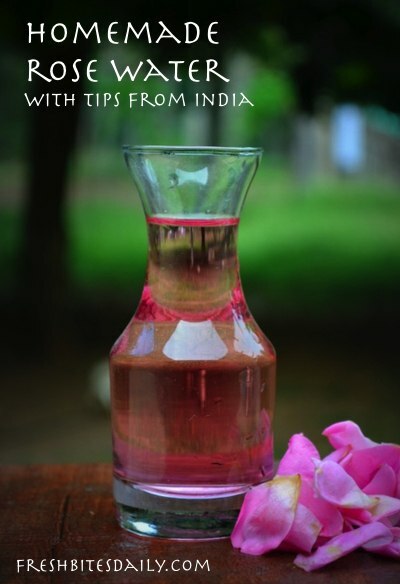 Making rose water at home is a such a joy and it is very easy to make. The quality of the rose water greatly depends on the quality of the roses you are using. Getting the right variety of roses, especially roses that are not sprayed with pesticides is very important. Select roses that smell good and are fresh. I have rose plants in our farm and I usually collect it from there, as it is very difficult to get pesticide free roses in the market here in India. The roses that I am using are quite fragrant — a variety commonly called “Damask Rose” — the best variety for making rose water. Damask roses don’t look very pretty and they are very rarely used in flower arrangements, but they are excellent for making jams and rose water. I usually collect the fresh roses early in the morning, when they are fresh and prefer to make the rose water as soon as possible. 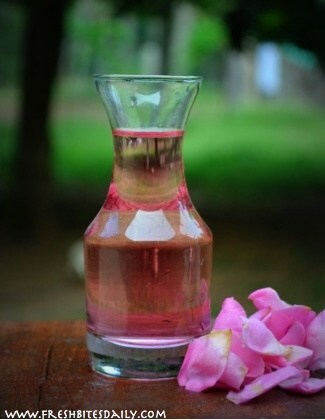 Rose water can be made in a variety of ways and the most basic method is by boiling the roses along with water until it reduces down to a flavorful liquid. However, I prefer the condensation method of making rose water (a hydrosol method), as the rose water made this way is very aromatic. Try making this rose water when you have plenty of time, as you need at least a good 2 to 3 hours of cooking time. There is very little work involved in making the rose water, only the cooking part takes time. To make this rose water collect fresh roses and gather a ceramic pot and three bowls according to the instructions. (A stainless steel soup pot will work as well.) Choose two bowls to use inside the pot — one which you will place upside down in your pot and one that you will place right-side-up sitting on top of the first. Take the first bowl, invert it, and place it in the middle of the pot. Add the roses. Place the second bowl on top of the inverted bowl to collect the rose water. Cover the pot with a bowl full of ice cold water, in lieu of a lid. Once it starts boiling, the vapors will rise hit the ceramic pot top, condense, and fall back in the container in the pot. Once enough rose water has been collected, switch off the heat. Remove the rose water that has been collected carefully and store it in a glass bottle in the refrigerator. A large bowl to cover the ceramic pot. Gather your pot, bowls, ice, roses, and water as per instructions above (and see these hydrosol post for more pictures and ideas): One large soup pot (preferably ceramic or stainless steel), three bowls — two bowls for inside the pot and one to cover the pot and hold the ice. Collect fresh roses, clean them well under running water to remove any dirt, and arrange them around the inverted soup bowl. The inverted soup bowl acts as a stand and its height should be above the rose petals. Pour water over the rose petals until it is almost to the level of the rose petals. Place the second soup bowl over the inverted soup bowl. The soup bowl should be wide enough to collect the rose water. Close the ceramic pot with the bowl full of ice cold water. This bowl will act as a lid and will also cause the steam to condense and drop into your collection bowl. Start boiling and once it comes to a full boil, lower the flame and boil for 2 to 3 hours. When it boils, the vapors will rise, hit the bowl with ice cold water, condense, and fall in the soup bowl. Boil until you have enough rose water and then switch it off. Carefully remove the rose water, cool, bottle, and store it in the refrigerator. As you work, make sure to check the level of the water and top it up to prevent it from completely drying out. Make sure that the top bowl with ice cold water covers the ceramic pot well and does not let the steam out. Add a few drops of rose essential oil to the rose water to make an even more aromatic toner. For a second method, I describe an approach in the video below. This rose water can be used as a toner or as a base for making homemade lotions and moisturizers. Of course, it is also used in recipes from Indian cuisine. This rose water can be stored in the refrigerator for about a month. Violets. Spring. Hope. Renewal. Frivolity.